So when last I posted, I was more than a little overwhelmed by my recent trip to The Eternal City. In 4 days I managed to cram what feels like a million little memories – and over 400 photos – into all of the nooks and crannies of my brain. But I think I have started to make a little sense of it all and a few curious themes have emerged that, with the help of my trusty guidebook, I will use to share my Roman holiday with you. ﻿﻿The theme of this post is gods. Rock gods. Gods made of rock, that is. They are everywhere…but as usual, there’s a wry twist (my brain does work in some strange ways) so hope you enjoy the views in more ways the one. The Emperor Trajan built Trajan’s Markets, a ‘visionary’ complex of 150 shops and offices, around 100AD just near the Forum. It sold everything from imported silks and spices to fresh fish, fruit and flowers and was considered one of the Wonders of the Classical World. (There’s hope for Westfield yet.) I wonder what sorts of things the Romans spent their TrajanCard points on? The Archangel Michael stands atop the Castel Sant’Angelo, the place that bears his name. (Let me tell you it’s high up there but the view is worth it.) He also pays tribute to the legendary appearance of the real archangel over the fortress in the 6th century which allegedly marked the end of a rather nasty plague. Despite being made of bronze, he is a god who definitely rocks. 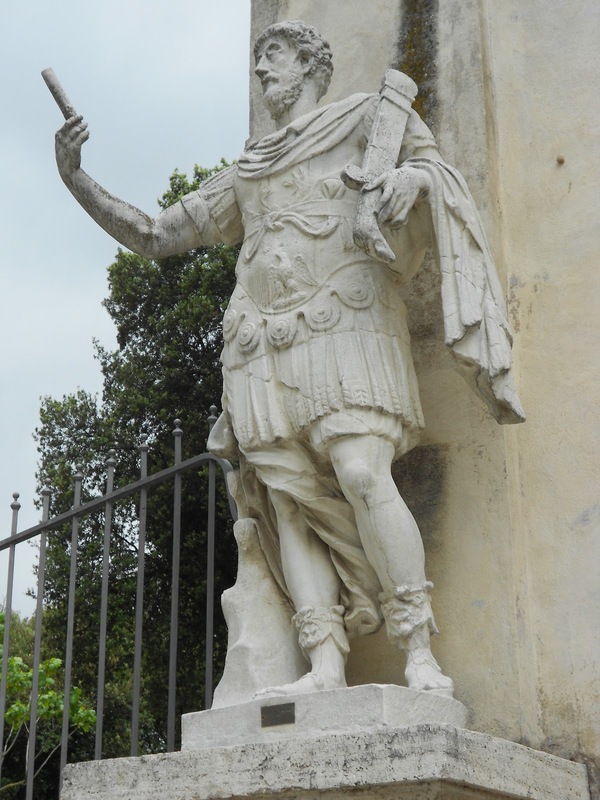 He stands in the Courtyard of Honour at the Castel Sant’Angelo. It looks like he began life as a mere statue and in a fit of jealous pique, stuck some questionable wings on his back, aspiring to the greatness of the one upstairs – the Archangel Michael, that is. This diva strop probably cost him the top spot on the terrace and he is now relegated to merely overseeing the courtyard (and the entrance the current Cupid and Psyche exhibition). 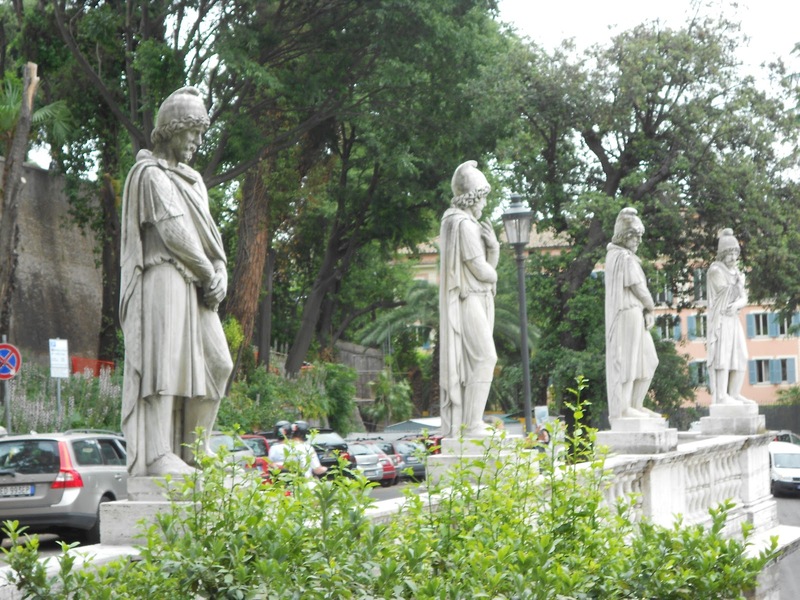 Located at the Pincio Gardens end of the Piazza del Popolo, this foursome overlook ‘The People’s Square’ which was the main entrance into Rome for the pilgrims. The Piazza, described by wikipedia as an ‘oval square'(? ), was the site of public executions for centuries. Hope no-one ‘lost their head’ over this fab four. 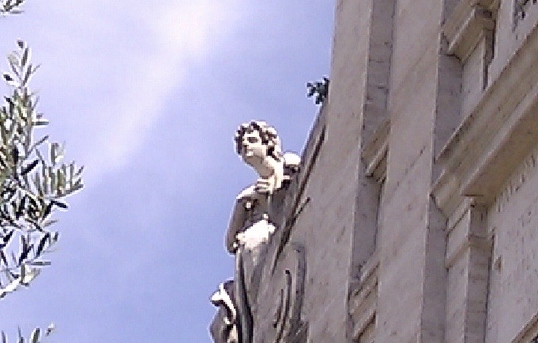 This cupid peeks over the edge of the Santa Francesca Romano at the eastern end of The Forum. It beats getting lost trying to find your way through all those basilicas and temples and such – he’d have a nice clear view down the Via Sacra from that vantage point. 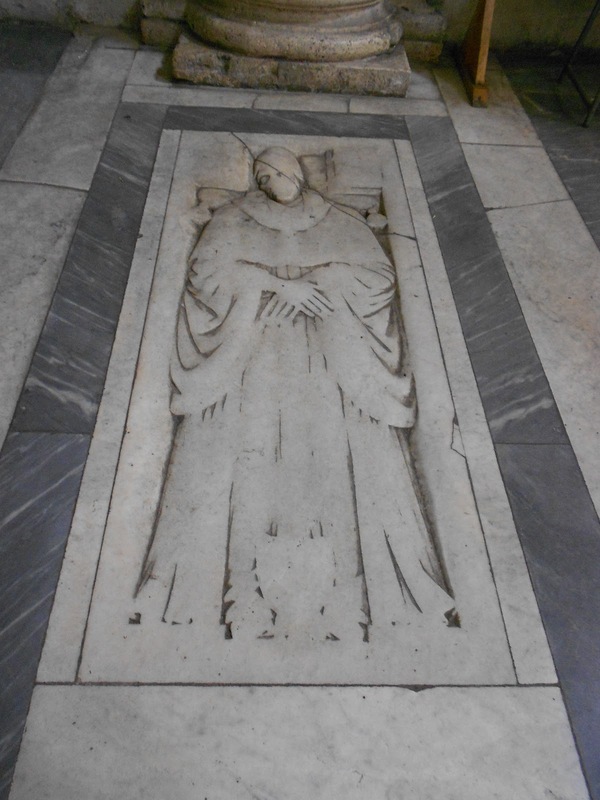 I think this one’s a King but I was in the process of being asked to leave Santa Maria del Popolo as they were closing. This was poor planning on my part. I thought I had visited this church earlier in my trip but on checking my trusty Eyewitness Travel Guide, discovered that I had lit a candle in Santa Maria di Miracoli on the opposite side of the piazza instead. So I dropped in, unplanned, on my last morning after wandering down from the Pincio Gardens and it was a very quick and sneaky snap on the way past the man speaking Italian at me as if I understood. I felt (and ‘this’ was) in no uncertain terms, underfoot. We’ve all heard of the Trevi Fountain – it’s one of the most popular places the tourists go and I braved the hordes on my first night – that’s why you get the strange yellow lighting in this photo. The Fountain was built in the 18th Century to mark the place where the Aqua Virgo aqueduct ended and features the god Neptune and 2 Tritones. Legend has it that throwing a coin in the Trevi will guarantee a return to the Eternal City – it worked for me last trip so I added another to the pile glistening beneath the surface. I couldn’t help but take a photo from the top of the open-top bus as we whizzed past the Piazza del Popolo and down the Via Ripetta. Check out this cheeky critter angling for some of those grapes. Little does he know they have a heart of stone. 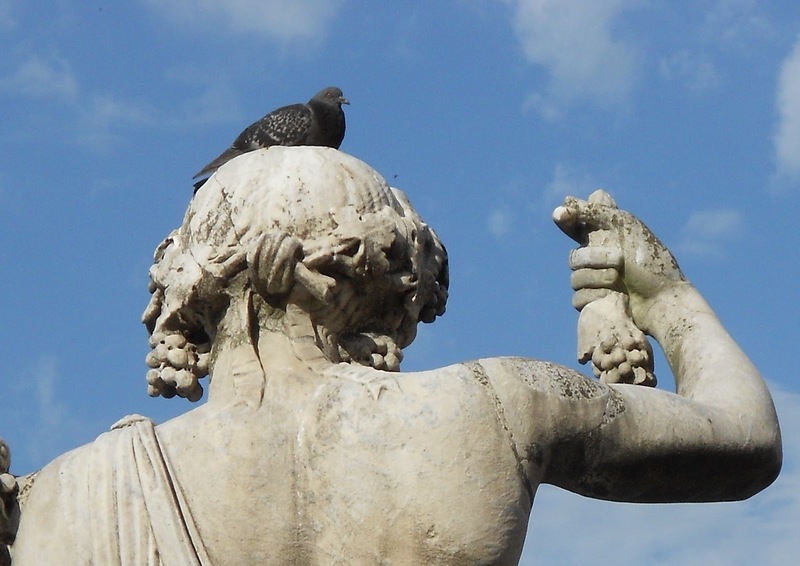 Oh well…pigeons will be pigeons. 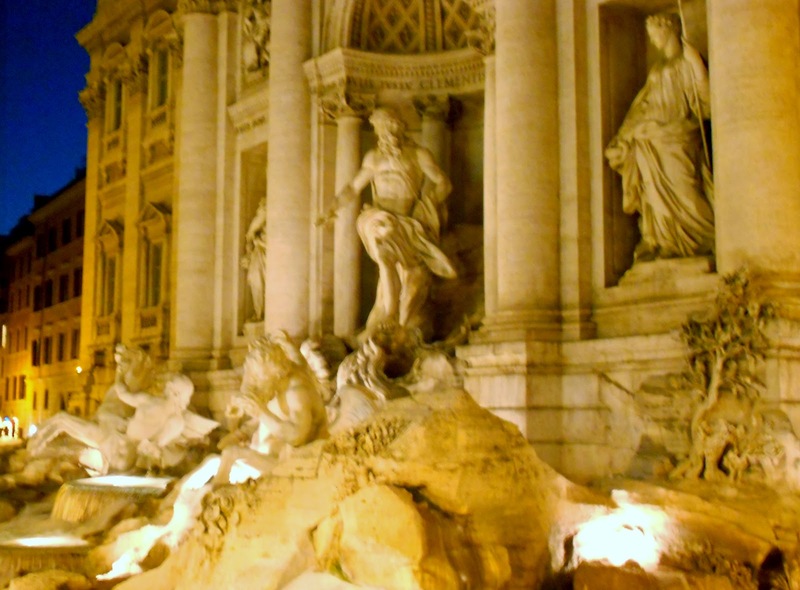 This entry was posted in A Traveller's Life, Armchair Tours, Expat moments and tagged Archangel Michael, Castel Sant'Angelo, Piazza del Popolo, Trajan's Market, Trevi Fountain by Kym Hamer. Bookmark the permalink. Grumpy Typewriter, did you turn your back to the fountain and throw the coin over your shoulder? It's been 10 years since I was in Rome as part of a 4 week Italian holiday. Think I should've thrown a bigger coin in the Trevi Fountain. I'm very jealous. Never been to Rome and really want to go.